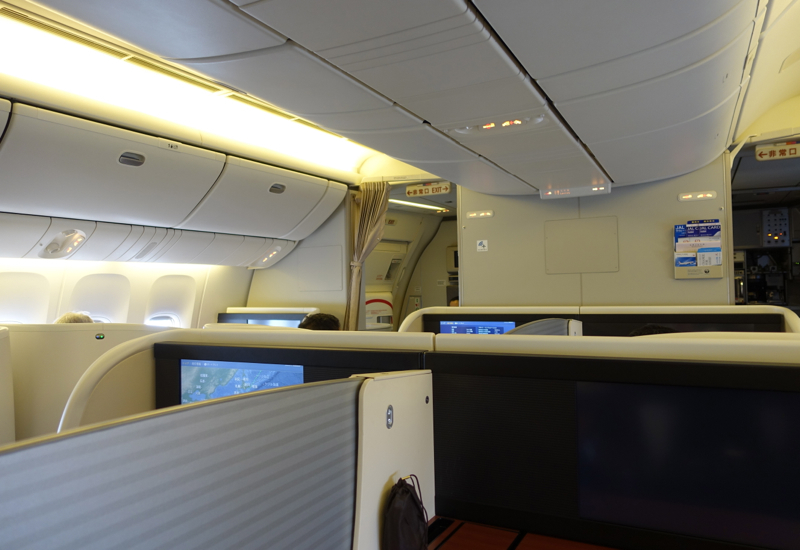 This Japan Airlines First Class 777-300ER Review is part of a trip report including luxury resorts and dining in Asia and the Maldives, including JAL First Class from Tokyo Narita to New York JFK, Etihad First Class and Emirates First Class. 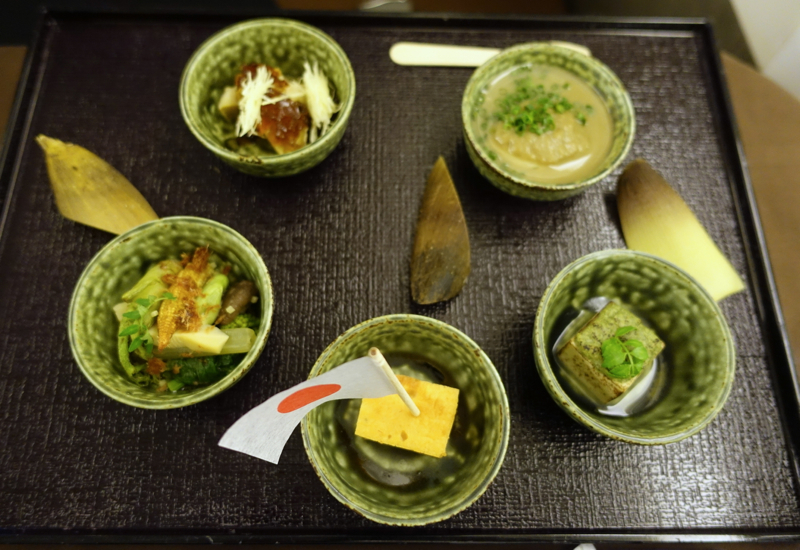 Having enjoyed JAL Skysuite Business Class last year, we were excited to try Japan Airlines First Class to experience the best the airline has to offer. 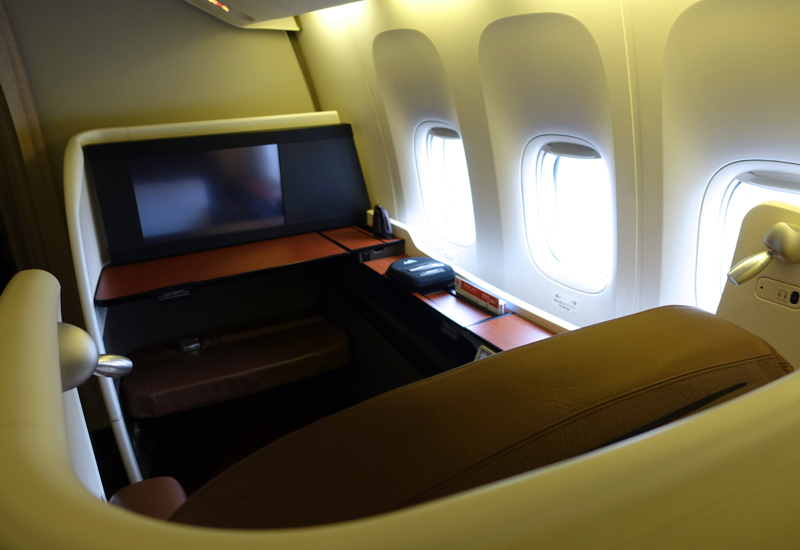 Japan Airlines New First Class on the 777-300ER features 8 open suites in a 1-2-1 configuration. The curtains to the galley area are kept closed most of the time, so I wouldn't be too concerned with the front row, although my personal preference is still for the 2nd row suites, to minimize disturbance when sleeping. 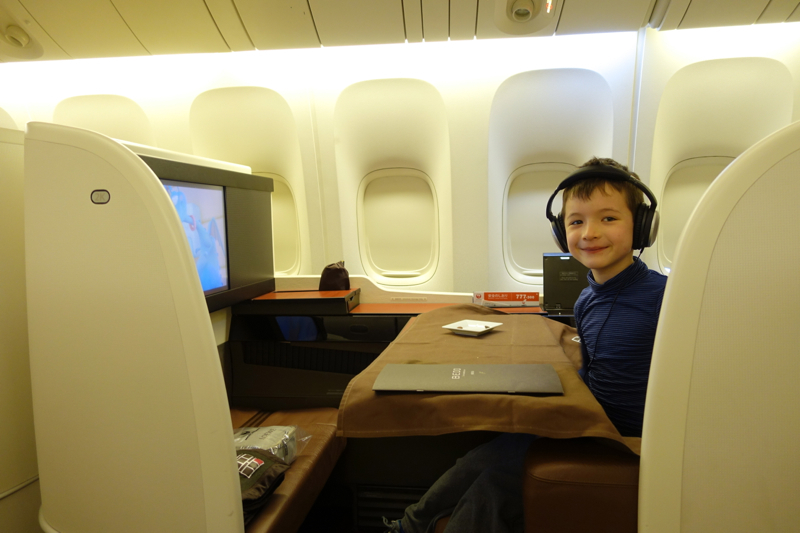 Since my son loves having a window seat, he was in 2K, and I was in 2G, across the aisle from him. It ended up being a good setup to sit across the aisle from each other, since we could see each other when leaning forward. 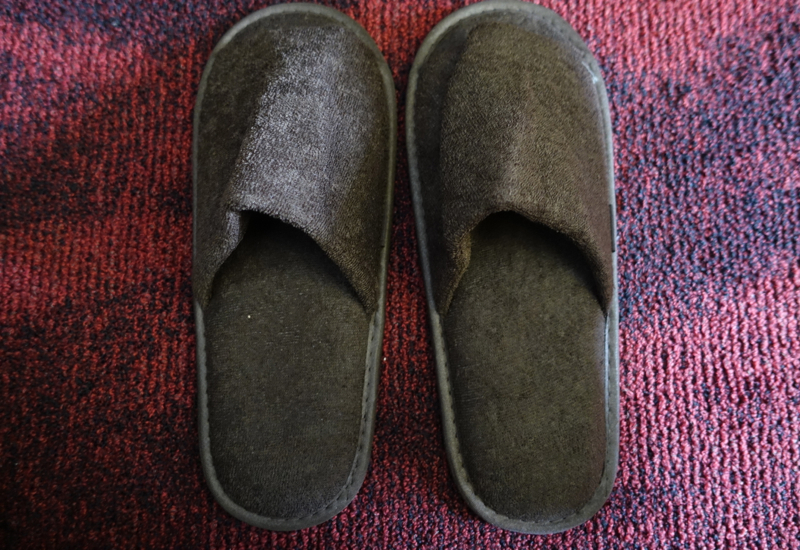 JAL new First Class seats are understated, with their neutral beige leather, and I can't say that I'm personally a fan of the faux wood grained interior–if it's going to be wood grained in first class, please make it actually wood, preferably a light wood. 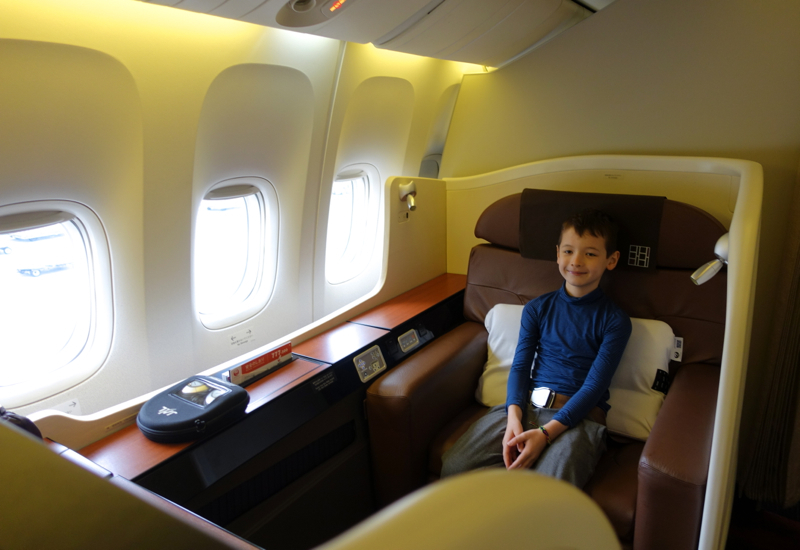 There's ample room, although the seats aren't of course as wide as Cathay Pacific First Class, where you can sit comfortably side by side with your child. 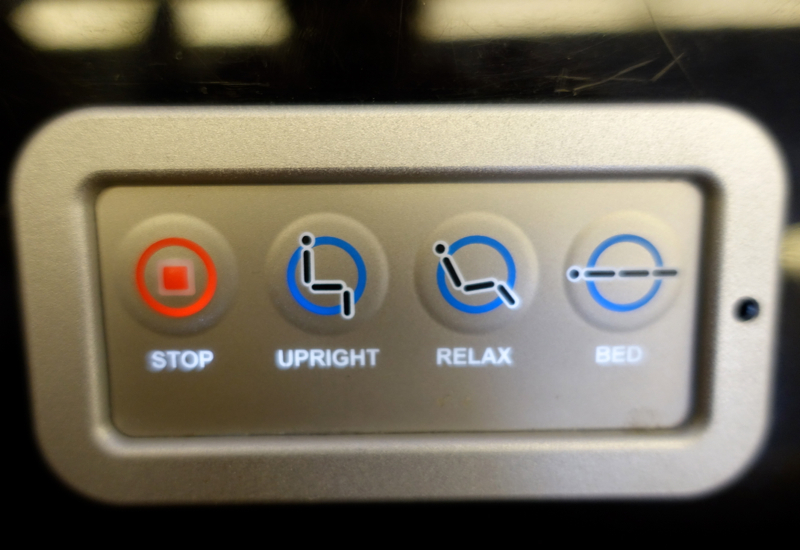 Seat controls are straightforward, and it's easy to recline it all the way into bed position. 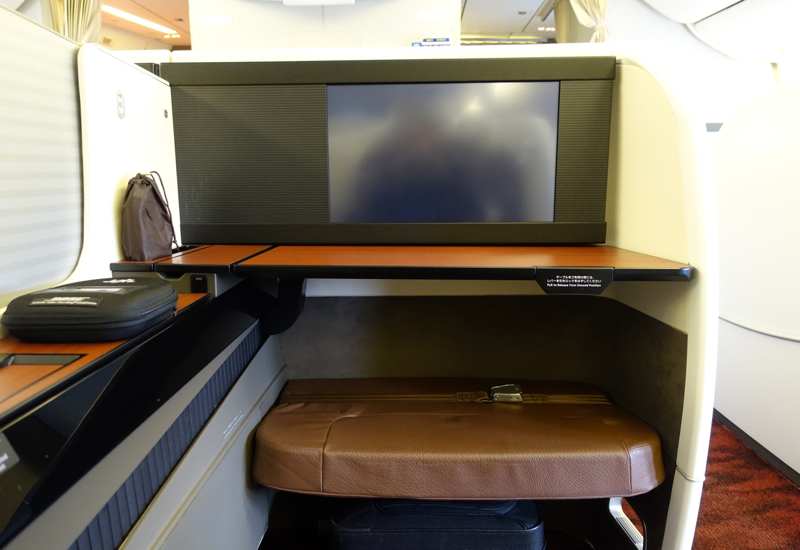 The TV screens are large, at 23 inches wide, and there's storage space below them. 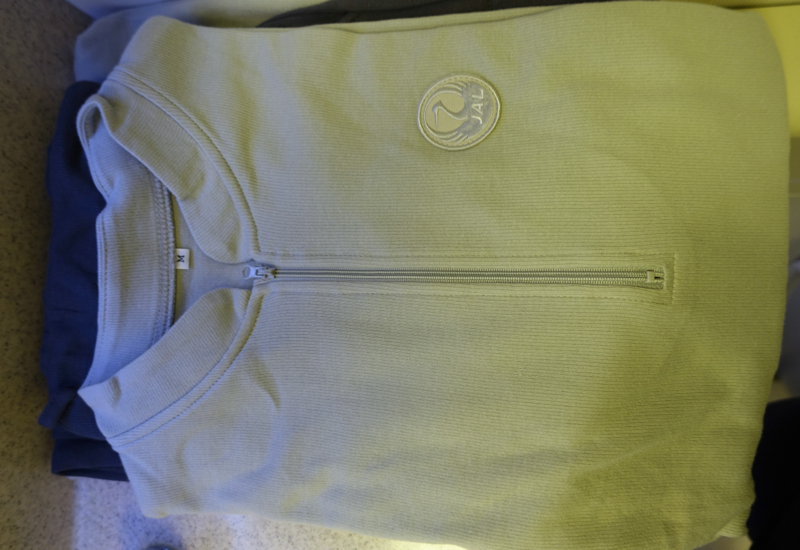 JAL's grey pajamas are not stylish, as Etihad's are, but they are incredibly soft and comfortable, and came in a pretty soft and well-made fabric pouch with silky interior lining that I continue to use. 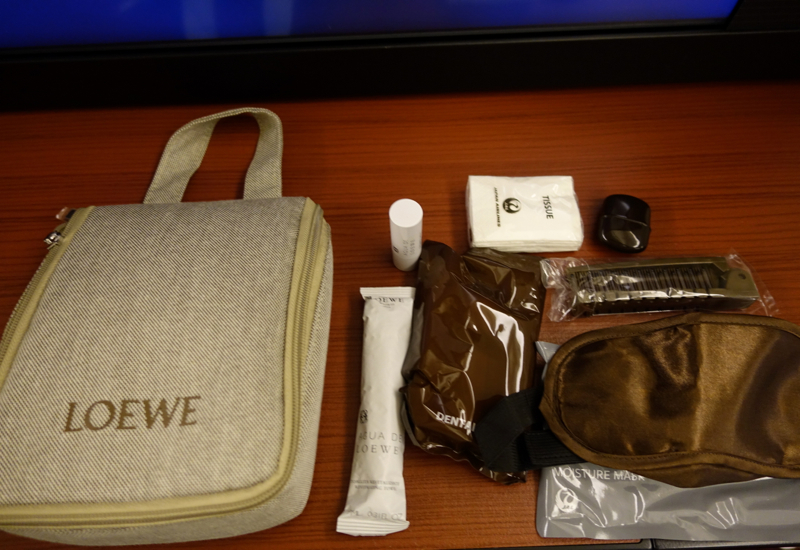 The women's amenity kit, in a fabric Loewe bag, contained the usual essentials of a sleep mask, toothbrush and toothpaste, earplugs, lip balm, tissues, brush/comb, plus a similar moisture mask to the one we received in JAL Business Class. 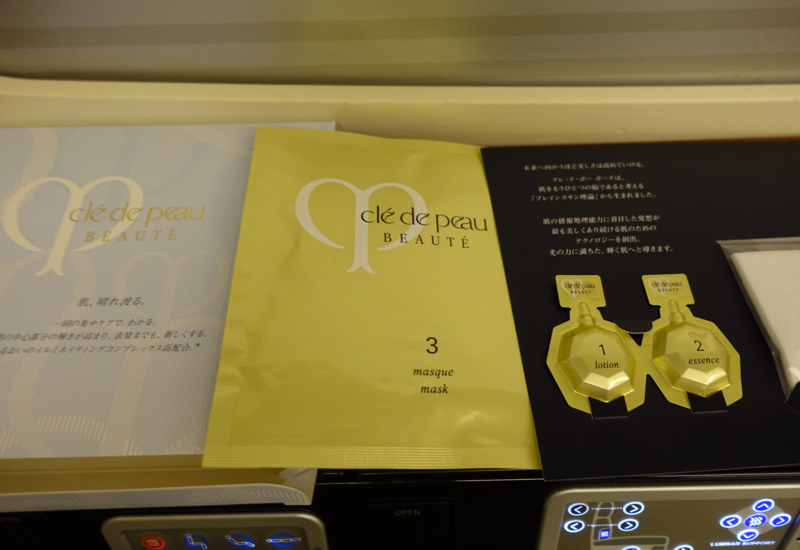 The special amenity, however, was a Shiseido's high end brand Cle de Peau Beaute, with special lotion, essence, and mask. After we were seated and before take-off, we were offered a pre-flight drink. 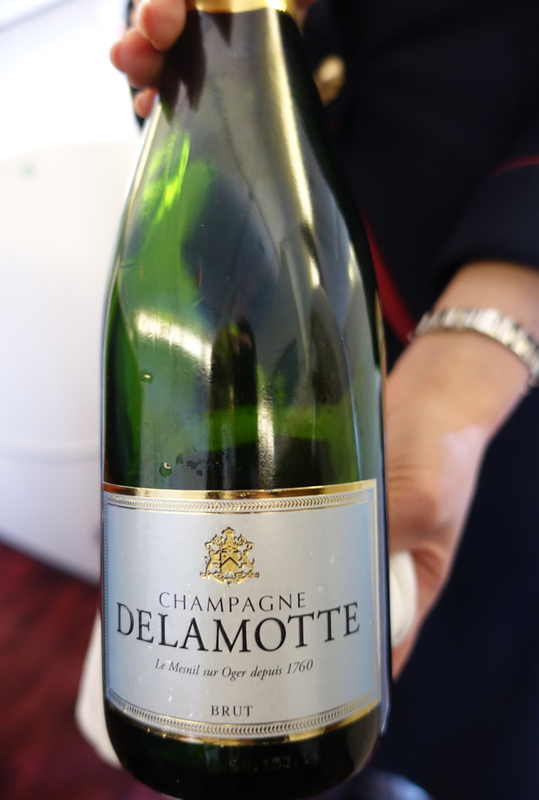 The champagne on offer was Champagne Delamotte, although the wine list offers Champagne SALON 2002 and Philipponnat Clos des Goisses 2004, which are several times the price. So if you're a champagne drinker, you'll want to turn down the Delamotte and request one of the other two instead. 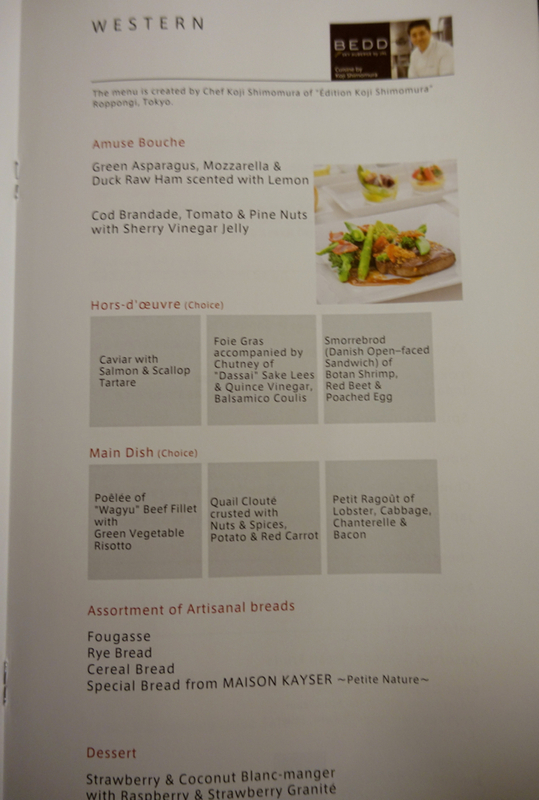 Japan Airlines First Class is a treat, food-wise, and I started to get hungry just perusing the Japanese and Western menus. 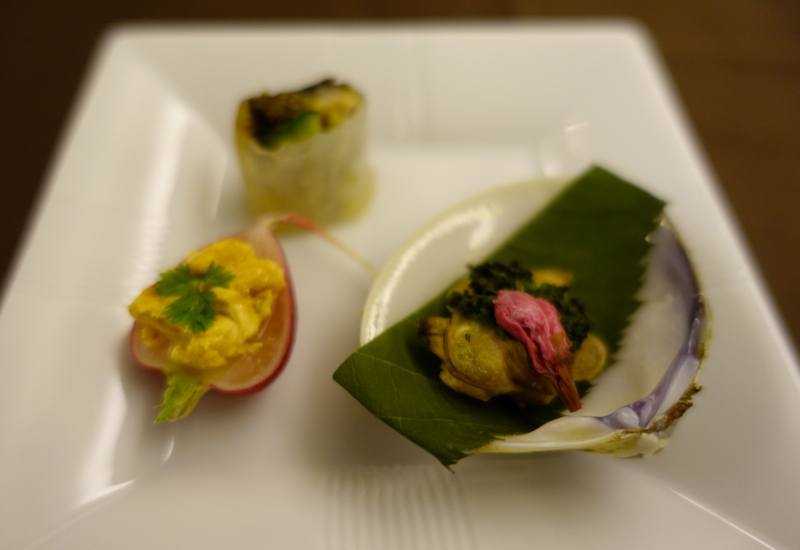 While I'm no expert in Japanese chefs, Seiji Yamamoto, the chef behind the Japanese menu, is known far beyond Japan for his innovative approach to traditional Japanese kaiseki cuisine at 2 Michelin star Tokyo restaurant Nihonryori Ryugin. 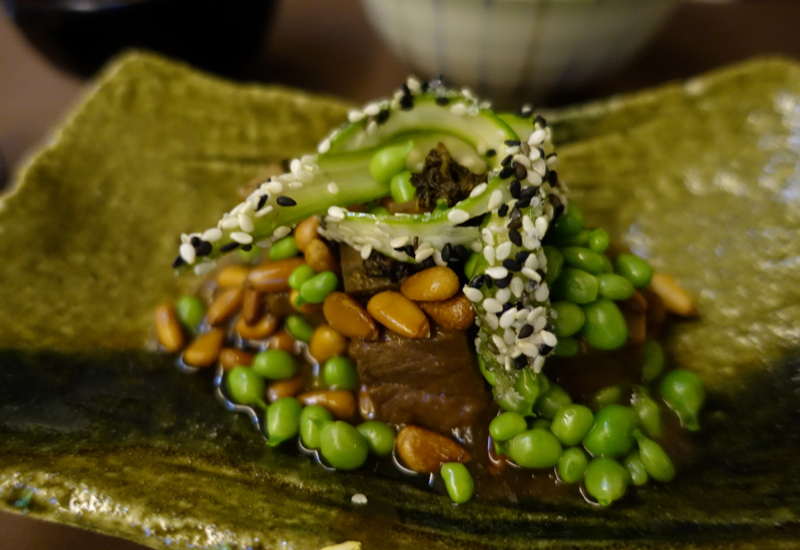 The Western menu, by Koji Shimomura, also sounded delicious, so I ordered it for the munchkin. 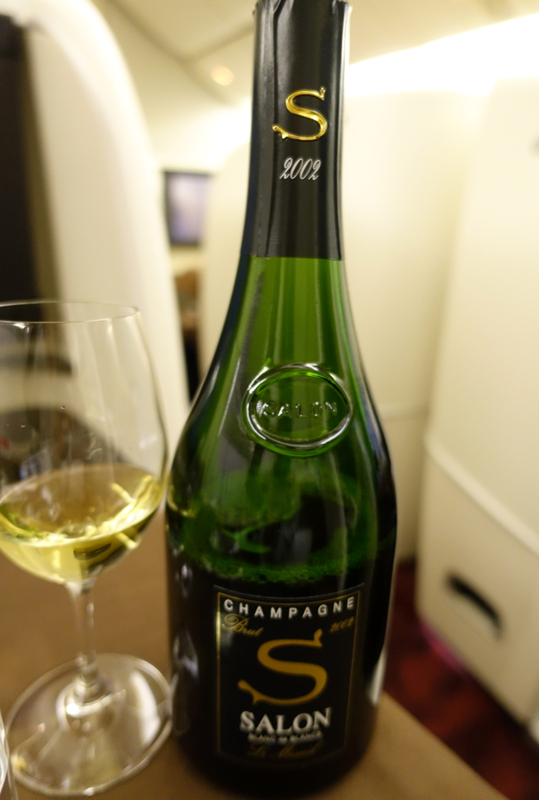 While deciding, I enjoyed a glass of Salon 2002–much better champagne, which even as a non-champagne drinker I could appreciate, compared to the Delamotte. 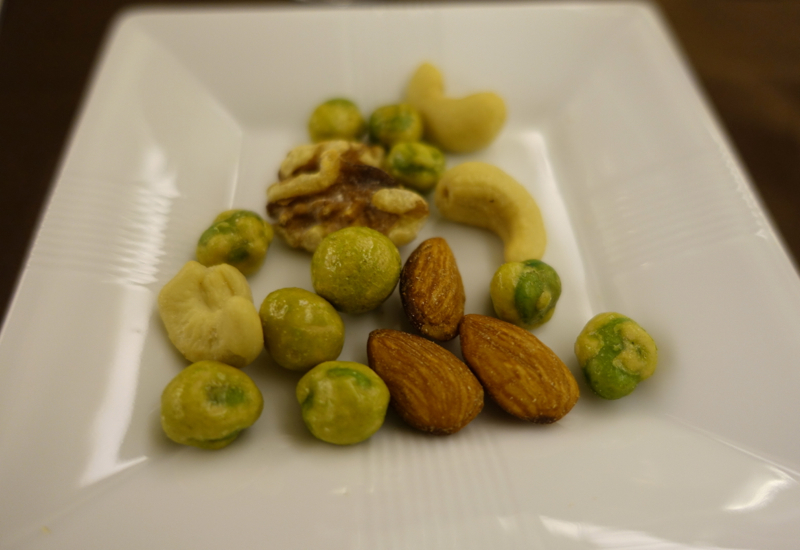 Wasabi peas and nuts were a welcome first snack, but I was careful to save room for the feast that was to come. Of the opening 5 Japanese appetizers, my favorite was the soft-boiled egg with uni (sea urchin)–truly a delicious combination. 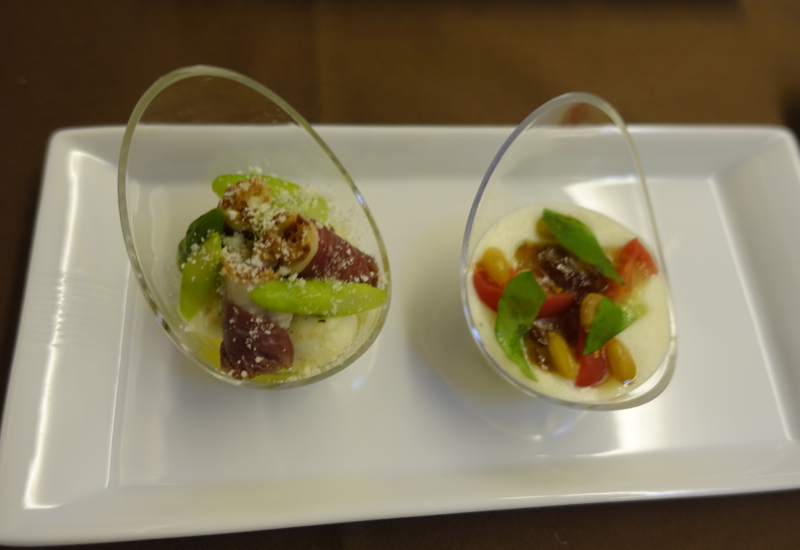 My son's amuse bouche included green asparagus, mozzarella and duck ham, as well as cod brandade with tomato and pine nuts. This was a bit too adventurous for him, but he did enjoy the mozzarella. 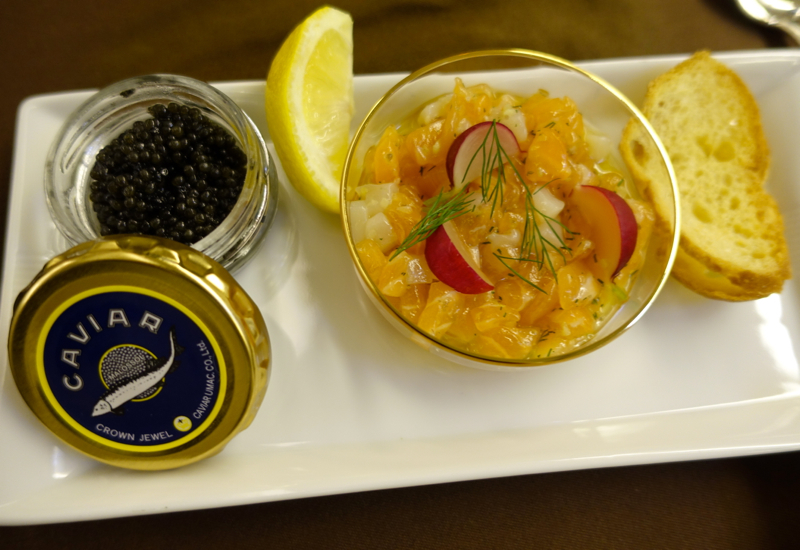 His next course from the Western menu was the caviar service, which came with a tasty salmon and scallop tartare. I had a few bites, but he mostly polished off this course off himself. 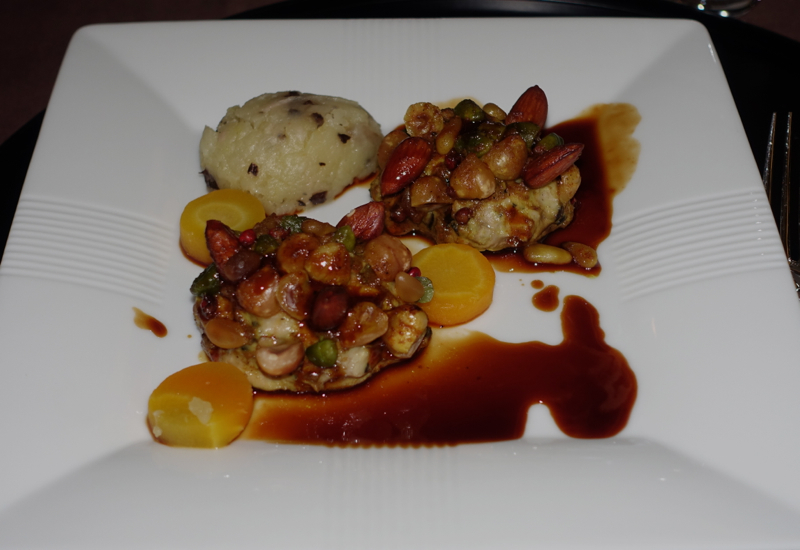 His main course of quail cloute crusted with nuts and spices was delicious–I ended up eating most of it, since I swapped much of my main course for his. Quail isn't seen all that often on regular restaurant menus, let alone on flights, and this was one of the best quail dishes I've ever been served. 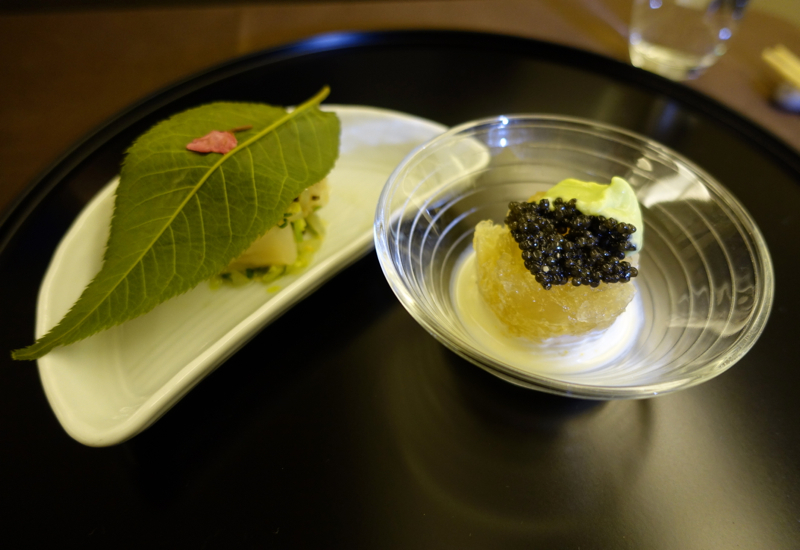 Going back to the Japanese menu, my favorite course was the seafood course of Japanese Spiny Lobster & Scallop Sashimi Style, even though I wasn't as fond of the accompanying White Asparagus dressed with Prawn Broth Jelly accompanied by Caviar. When it comes to caviar, I'd rather have it served with traditional accompaniments or with a salmon dish, such as on the Western menu. The main course was Grilled Wagyu Beef Fillet with Japanese Butterbur Soy Sauce. My son really enjoyed this, which is why we swapped, while I found it a little one dimensional, and preferred his quail dish. 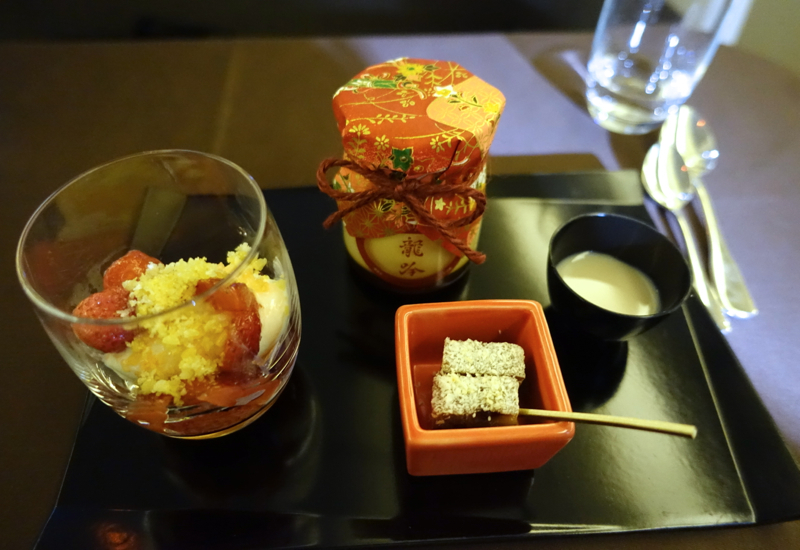 Normally I don't expect much where Japanese or Asian desserts are concerned, but a pleasant surprise was the trio of desserts served as part of the Japanese menu: Japanese Baked Strawberry Cake, Yogurt Ice Cream with Strawberry, and Ryugin's Signature “Roppongi Pudding” served in a glass jar with its cover adorned with origami paper. Not only did it perfectly reflect the spring season by highlighting strawberries, everything was fresh, delicious, and served at the proper consistency (unlike, say, the rock hard frozen dessert we'd encountered in JAL Skysuites Business Class last year). 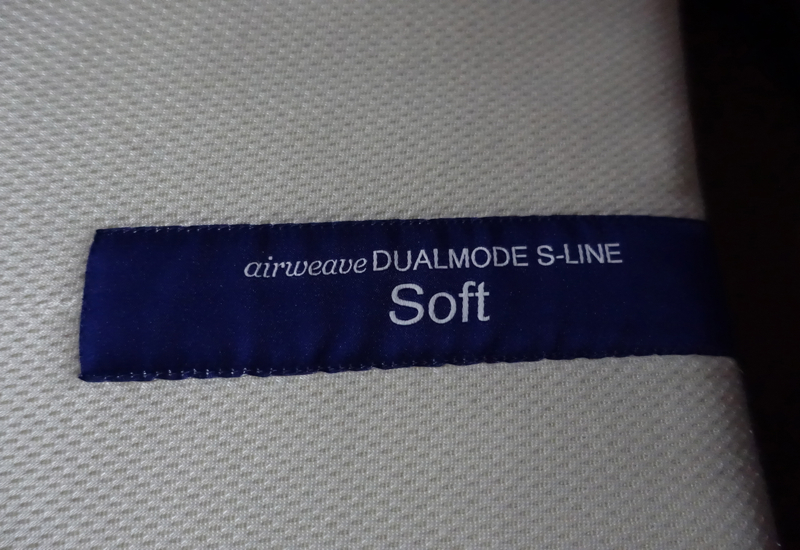 To me, the best part of the new JAL First Class suites are the use of airweave dual mode memory foam mattress pads, which have a firm side and a soft side. 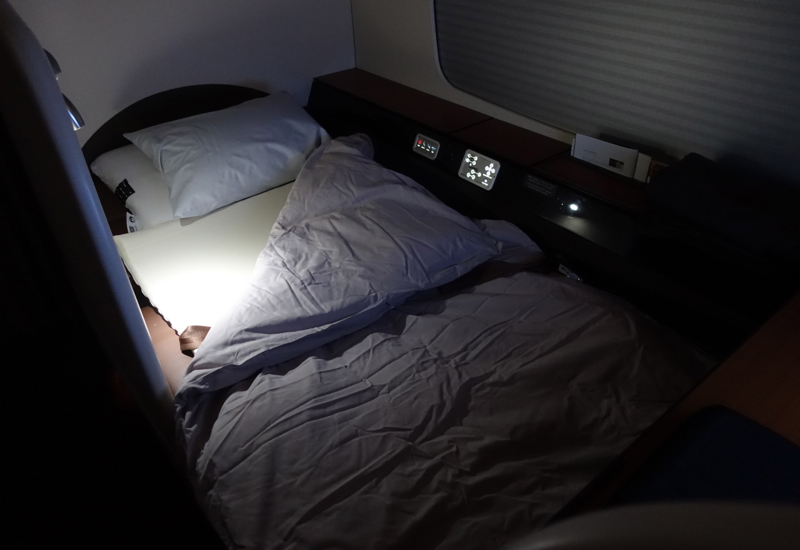 While I still give an edge to Singapore Suites in terms of overall sleep comfort (it helps that Singapore Suites has a separate sleep surface, which is why flight attendants have to make the bed), I'd put JAL new first class with the airweave mattress right after Singapore Suites in terms of comfort. I managed to sleep a good 6 hours straight. My son slept even longer than that, around 8-9 hours. 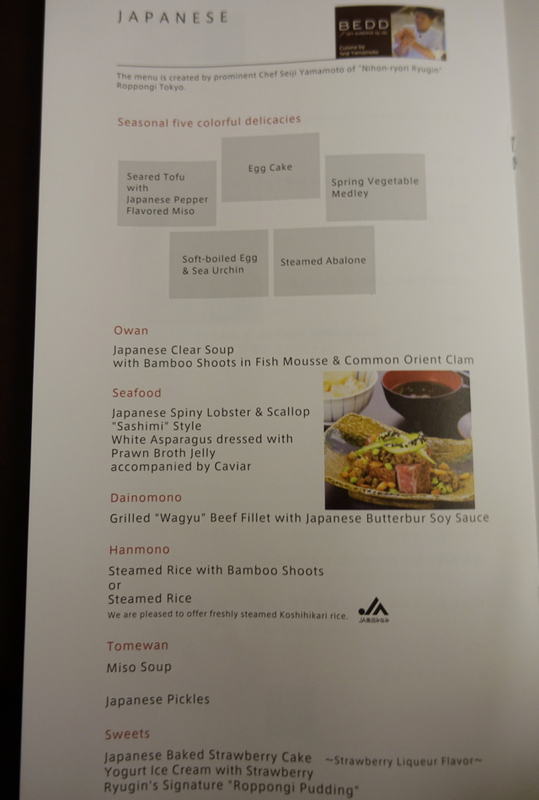 JAL First Class service was very good, and the flight attendant whom I interacted with spoke excellent English and was able to answer my questions about the Japanese menu. She also helped translate the instructions of the Cle de Peau Shiseido skincare, which I didn't realize initially was Shiseido and which only had instructions in Japanese. 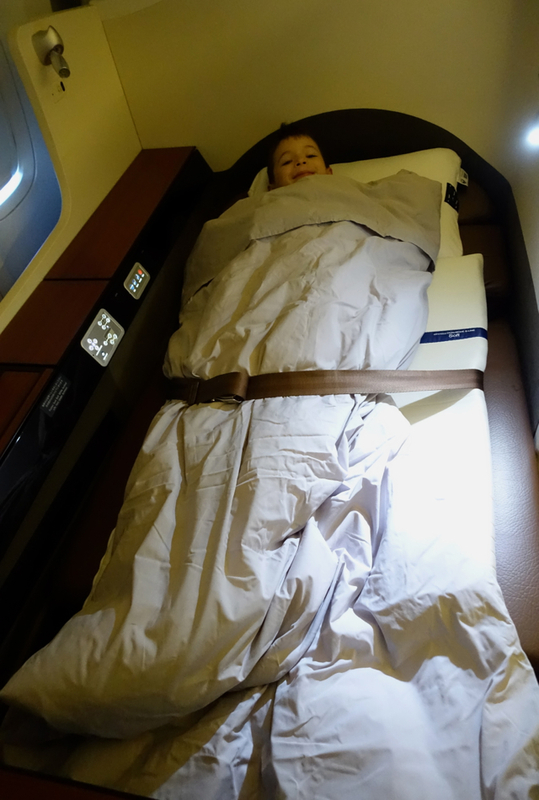 I did find that we needed to seek out a flight attendant to have turndown service, since as with Cathay Pacific service is more based on your asking for what you need rather than proactive, as on Singapore Airlines–in that sense, I prefer Singapore Airlines as it avoids having to seek someone out. 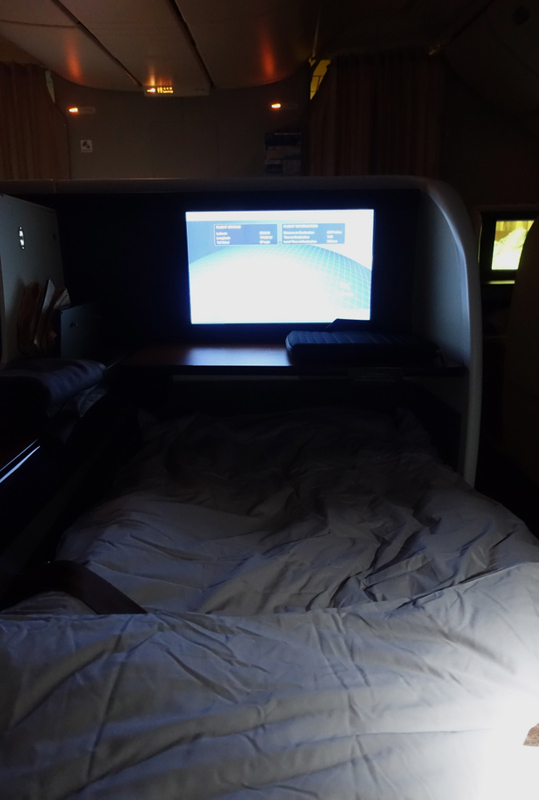 We had a fantastic experience in JAL First Class, mainly because of the comfortable beds and the great food. Service was very good and friendly, but not quite as experienced and polished as, say, Singapore Airlines, and the IFE also didn't have the extensive selections Singapore Airlines offers. The bathroom is small for First Class, without any flowers or special skincare products or moisturizers, so I do think that's a slight detractor from an otherwise very positive experience. 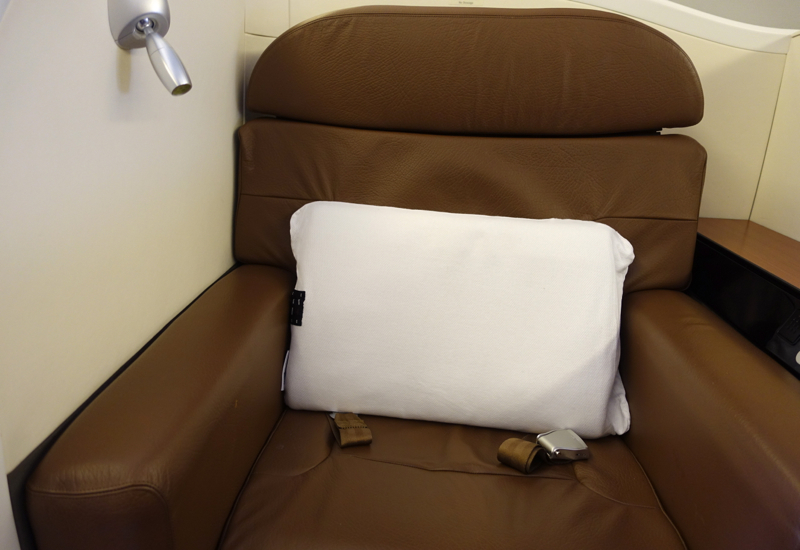 If you've flown Japan Airlines First Class on the 777-300ER recently, what was your experience?